Still no word on modern-day storyline though. Assassin’s Creed: Origins is a game that tells the story of Ba-Yek, who we now know will go on to create the Assassins Brotherhood we’ve been seeing the growth of over the series. And while the upcoming game will be primarily his story, Ubisoft have confirmed that there will be other playable characters in the game too. During the game’s E3 Coliseum panel, the game’s director Ashraf Ismail was asked if there would be playable female characters in the game. Ishmail, in response, said that Origins is primarily supposed to be Ba-Yek’s story, but that there will be some sections in the game’s campaign that will see players controlling other characters for the story’s progression as well. That, however, was as much as he chose to say on the matter. That definitely sounds interesting. Whether these other characters we can play as are featured in the Ancient Egypt storyline or the modern-day story set outside of the Animus, we don’t know yet- in fact, Ishmail was coy on whether or not the modern-day Abstergo Industries story will be included either. 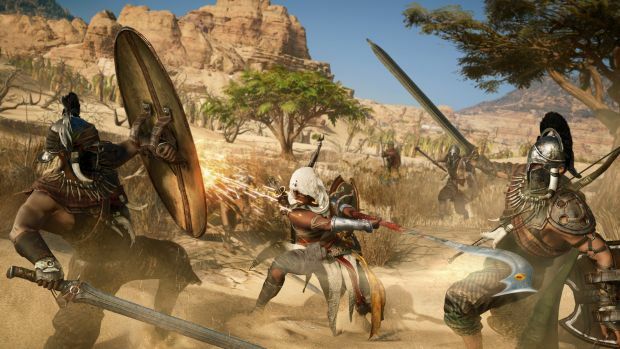 Stay tuned to GamingBolt for continued coverage on Assassin’s Creed: Origins.